Disclaimer: I am not being compensated for this review – I found a product and fell in love and I’m sharing my experience with you candidly, and PRO Compression was nice enough to let me include a giveaway with this post. As I’ve gotten into running, I’ve heard more and more about compression socks but had never tried them. When PRO Compression posted a 40% off coupon code on Facebook back in 2012, I jumped at my chance to try them…and I’m so glad I did! My first impression of the socks was that they felt good – they were tight and took a bit to put on, but once they were in place I could feel the compression and it felt really nice. I did my run and noticed that my calf muscles didn’t get sore as quickly, but I wasn’t sure if it was because I was coming off a rest day or because of the socks. After a few more runs, I could definitely give credit to the socks. I noticed after my workout and into the next day that my calf muscles didn’t have the typical soreness I normally felt after a run. I could definitely feel my workout, but I wasn’t as stiff. And I noticed it even more when I felt that stiffness and soreness after my cardio workouts the next day. So what did I do? During the next round of cardio workouts I wore my socks – and I experienced the same lack of soreness! Another awesome benefit I’ve noticed is no blisters and a decrease in calluses – my feet definitely get beat up from running and my workouts, but they don’t take as much of a beating, and breaking in new shoes and long runs aren’t as painful. Needless to say, I’ve purchased many more pairs and I wear them during all of my workouts…and they’re so comfortable that I end up wearing them for hours after, too. Some people even sleep in them – I have yet to because I’m normally pulling them off to shower at night, but I would very happily sleep in them. I’ve also gotten hooked on their Trainer Lows as well and I’ve replaced all of my short workout socks with them. They’re great for when I want support for my feet but I don’t need full calf support, they are much more comfortable in my shoes than my old cotton socks, and they’re super cute and available in a bunch of colors. My husband has already stolen a few pairs and he loves their Mid Sock style, too. My socks have been through many workouts they’ve been machine washed/air dried multiple times and they’re still holding up wonderfully. I have yet to have a pair fail me and I still wear my first two pairs that I bought with that original discount code. Now through July 31st, PRO Compression is letting you save 40% off plus FREE shipping off THEIR ENTIRE STORE! Use coupon code FITCC at checkout. Enter to win a FREE pair of Marathon Socks! 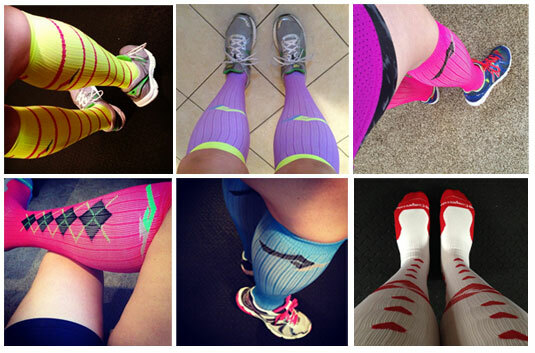 That’s right – PRO Compression is giving one lucky person pick a pair of their Marathon Socks or Calf Sleeves ! Enter below now through the end of the day July 31st, 2015. I will announce the winner on my Facebook, Twitter and Instagram pages on Saturday, August 1st! Also, be sure to share some love with PRO Compression on their social media pages – they have an awesome Sock of the Month program and always post random coupon codes so you never, ever have to pay full price. Please add me to your mailing list for nutrition and exercise tips and updates on future giveaways and challenges (limited number of emails, no spam). I am not working with a Beachbody coach and I would like to receive personal coaching with Operation Fit to meet my goals (No purchase necessary).